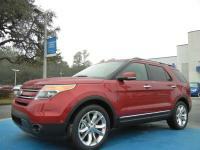 Ford of Ocala, specializes in New/Used Ford Cars, Trucks, SUVs, service, parts, and financing. Quality, reliability, and convenience are a few of the reasons why Ford of Ocala is the right choice. Where Your Time is Valued, Your Choices are Endless, and Your Terms are met! We are conveniently located 2 miles north of Downtown Ocala on Hwy 441/Pine Ave. Turn Left at the Burger King stoplight. The traffic's not bad at all.